I had thoughts of this earlier.... it's going back a bit.... nearly 20 years in fact. I remember back then stumbling across making money online. The survey industry wasn't like it is now and the main ways to earn were via GPT programmes and "paid to read" (PTR) for literally pennies. So many "paid to read" sites opened up which used the same PHP script. You would check your onsite inbox for "paid emails". Click the link, it would take you the the advertiser's page and a timer would be at the top (30 seconds countdown), once reached 0, you were credited. The amounts were stupidly low mostly and i'm talking 1/5th of a cent sometimes. Getting a 1c paid link was quite rare. Earning a % of what people you refer earn was a thing. Oh and "buying referrals". You put a set amount of cash in, then the next 10 people who sign up with no referral link become referred by you. I remember on 1 site, "allyousubmitters" where the minimum payout was something like $50. I used the site for years, earning those pennies. I got to about $48 and the site collapsed for good. Then again, it was always going to die out. I guess the whole point of PTR was that a company or business would pay to have their website shown to people. Some people would then sign up or use their services. Actually what happened was people viewed links purely for the money. Which opened the door to what it became..... "clickfraud" and scamming advertisers. Well, as businesses and companies were not benefiting, they stopped paying for views in this way. Google "adwords" was about and these "paid to read" links pretty much became clickfraud central. An "advertiser" would set up a cheap garbage domain (it could be anything like holidaydeals157464.com or shopItNow4Free.com. You get the idea). That domain landing page would be filled with keywords. The owner of the domain would pay advertiser fees to the PTR site. The email description would encourage viewers to click 1 link on the page with the promise of more paid emails. Effectively, the advertiser would be paying the PTR site, who would take a cut and pay it's members some. Then the advertiser would make their money from google via links people clicked. Of course, after a while Google were wise to this and started suspending members who did this, advertisers couldn't make their cash this way and bang went the good old PTR days. Although dead and buried. Clickfraud does still happen a bit on "get paid to" sites, like Swagbucks. Namely, "OfferToro" where each day you can do a search on a travel site for 1SB. It's got the made up domain name, landing page has a banner to click, then do a holiday search. Members gain 1SB and the advertiser earns a bit more per search. I guess I will also mention around the same time the whole E-gold, Forex and "Bubble games", as people might remember them too? Bubble games were, I think sort of like pyramid schemes. Anyone could buy bubble game PHP scripts and launch a bubble game. Normally paid for via the "E-gold" payment processor, it works where people pay money for their link to be shown on the page. Lets say they pay £1. If the bubble return was set at 120%, there would need to be more people paying to put their link there (£1.20 plus maybe 20p for the bubble game owner). That link then "bursts" (vanishes), the advertiser gets £1.20 and the next link moves to the top, until enough money has been put in to burst that as well. Really, it could never be successful. With each person "investing" the amount to burst bubbles increases, until eventually it needed something crazy like £100 to burst all bubbles and so nobody would invest anymore and nobody else would get their money back. Some would reset (wipe all links) after a certain time, so money would always be lost regardless. No idea what happened to them, although probably made illegal? Then the "Forex" stuff. Sites popping up left right and centre with people saying they are experts at Forex trading. They wanted money to invest with "guaranteed" profit returns. Quite a lot of people did make money, but everyone eventually lost out. Normally the site owner would make a bad choice, lose it all, close the site down and vanish without a trace. It was a crazy world online. 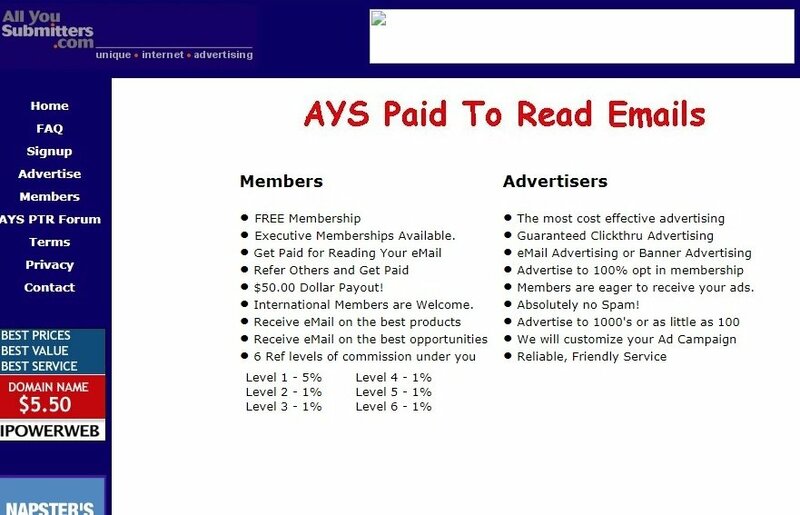 The paid email script you refer to was the cash crusader script. Believe it or not it is still about for purchase today. I myself ran one of those and it got pretty big literally overnight (around 30k members). It was called get-mails.com if anyone remembers that. There are still two of the major sites that were about when I was online still going today - donkeymails and no-minimum (that I am aware of). The paid search market started low key but went crazy when domain parking and some specialized paid to search PTR sites came up (normally from China). The volume of these fraud clicks was insane and it took several years to stamp it out. The search market was literally paying for the entire GPT industry back then and when it finally got stopped (thanks to the demise of XML search feeds from Yahoo / Google), the candle was finally snuffed out. Most ad's in the PTR world were paid search ad's, and when the fraudsters lost the ability to implement the ad feeds, their ad's dried up. Unfortunately this created an extremely negative view of the GPT industry that is almost impossible to shake off. Surveys have taken over but even then there are a plethora of unscrupulous website owners who are there to not only steal money but also steal your time. The whole GPT industry is recovering, thanks to greater awareness of 'at home' workers. Long may that continue.